Yigal Landau, CEO of the Ratio partnership, was interviewed on Reshet B for Michael Miro’s program, and said that: “The government has not missed any opportunity to miss an opportunity (regarding the gas deal) and has not prevented any pitfalls on the way. In “Where’s the Money?” (Reshet Bet Radio) with Anat Davidov, Yigal Landau, CEO of Ratio, was interviewed regarding the decision by the Supreme Court on the gas deal. Yigal Landau, CEO of Ratio Gas Exploration, was interviewed by Ilana Dayan on Galatz on the subject of the emerging gas deal structure. Yigal Landau is the Managing Director of Hiram Landau Ltd., CEO and Member of the Board of Ratio Oil Exploration Ltd., and a board member of the Union Bank of Israel Ltd.
Yigal Landau was interviewed for an article published by Calcalist and explained that phrases like “the gas robbery” do not do justice to the citizens of Israel. The gas industry has been booming for over 3 years but after quite a few committees, industry has again ground to a halt, when at the end of 2014, the Antitrust Commissioner withdrew from the agreement signed with the gas companies. Yigal Landau, CEO of Ratio, was interviewed on 13/08/15 on the program “Five in the Evening” with Yaron Vilensky on a Radio broadcast about the gas pipeline. On the program Yigal Landau said the following. תוויות: Army Radio, deep in the ground, gas outline, Yaron Wilensky, Yigal Landau. Bookmark the permalink. Following the gas controversy created following the signing of the new gas blueprint, the CEO of Ratio, Yigal Landau, was interviewed by Ilana Dayan during her program on Galatz, and he explained that the gas deal will bring about stability in the gas market and will allow it to develop. 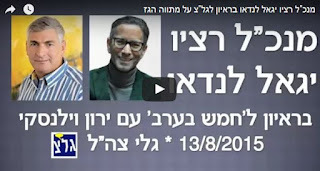 תוויות: Army Radio on Yigal Landau, gas drilling, Ilana Dayan, Ratio, the gas monopoly. Bookmark the permalink. Yigal Landau, CEO of Ratio Oil Exploration, was interviewed on Galatz during Ilana Dayan’s program on the gas blueprint.